Leptin (a 16 kDa polypeptide hormone) is predominantly produced by white adipose tissue and plays an essential role in neuroendocrine function, body weight, and energy expenditure homeostasis. Mice deficient in leptin developed marked obesity with diabetes and administration of exogenous leptin to these mice causes dramatic reduction in weight. It was first of all reported by Mammes et al., that G2548A variant in the promoter of leptin is associated with reduction in body mass index (BMI) in overweight women. Leptin receptors were first of all identified in hypothalamic regions and are associated with food intake regulation. Leptin modulates insulin secretion and act via leptin receptors. Few studies have reported that chances of developing obesity are associated with the leptin receptor (LEPR) gene polymorphisms., In rodents and humans, mutations in the LEPR gene results in the formation of a truncated receptor, which in turn have been shown to cause obesity and diabetes., Although such mutations are very rare, but such events are central in explaining the role played by the leptin in regulating energy balance in rodents as well as in humans. It has been investigated that some polymorphic variations associated with leptin gene (LEP A19G) and leptin receptor gene (LEPR K656N, Q223R, and K109R) are considered as possible factors linked with obesity. These authors further reported that the allelic frequencies of these polymorphisms show ethnic variation. A total of 620 ethnic Kashmiri subjects were selected for the study, which included 200 persons with diabetes, 200 obese patients, and 220 healthy controls. Among 200 obese subjects, 50 persons were with diabetes. Inclusion criteria included patients diagnosed with type 2 diabetes mellitus (T2DM), patients were selected for diagnosis with T2DM based on criteria set by the American Diabetes Association (symptoms of diabetes plus a random blood glucose concentration ≥11.1 mmol l −1; fasting plasma glucose (FPG) ≥7.0 mmol l −1; 2-h plasma glucose ≥11.1 mmol l −1; during an oral glucose tolerance test; HbA1c level ≥ 6.5), patients were overweight with a BMI of ≥25, higher lean body mass, people belonging to Kashmir division. Exclusion criteria included people not belonging to Kashmir division, individuals who did not comply with the requisite patient proforma, drug-induced patients, gestational diabetes patients, genetic syndromes associated with diabetes and obesity. Blood samples of the subjects were collected from the Endocrinology Department of the Sher-i-Kashmir Institute of Medical Sciences (SKIMS), Soura, Srinagar, Jammu and Kashmir. Samples of the patients were collected after the complete clinical investigation and all subjects signed written informed consent. Subjects were encouraged to narrate all the details relevant to this study. This included age of the subject, dietary history, gender, history of onset of diabetes/obesity, personal habits, any associated complications, socioeconomic factors, and information regarding close work. Venous 3–4 ml blood samples were collected in ethylenediaminetetraacetic acid (EDTA) for DNA extraction. Samples were kept at −70°C until analyzed. Expected PCR products of 242bp were generated successfully. The PCR cycling conditions involved: one cycle of denaturation at 95°C for 5 min, 30 cycles of denaturation at 95°C for 45 s, annealing at 60°C for 45 s, extension at 72°C for 45 s, and one final 7-min elongation cycle at 72°C. PCR products were then purified using purification kit (Sigma). Purified PCR products were sequenced to confirm the presence of sequence variations. Sequence results obtained were analyzed using software's like ClustalX and Chromas Pro for the detailed inspection of individual chromatograms. Genotypes were obtained by direct counting with subsequent calculation of allele frequencies. Statistical analysis was undertaken using the Chi-square test and significance value (P). A P value of < 0.05 was considered significant. Adherence to the Hardy–Weinberg equilibrium constant was tested using the Chi-square test with one degree of freedom. Odds ratio (OR) and confidence interval (CI) were also calculated. The anthropometric and biochemical characteristics of cases and healthy control subjects are presented in [Table 1]. Affected people were divided into three categories i.e., persons with diabetes, obese subjects, and obese persons with diabetes. The mean age of controls and cases was 50.32 ± 8.83, 51.28 ± 13.05, 49.88 ± 11.21, and 49.08 ± 11.64 years, respectively. Mean BMI of cases and controls was 21.71 ± 1.31 kg/m 2, 24.02 ± 0.95 kg/m 2, 34.61 ± 4.99 kg/m 2, and 35.02 ± 6.11 kg/m 2, respectively. The cases presented with higher BMI and waist-to-hip ratio (WHR) as compared to controls (P < 0.001). There was no significant difference in parameters like age and high-density lipoproteins (HDLs) in both cases and controls (P ≥ 0.05). Also parameters like resting plasma glucose (RPG) and HbA1c% were not significantly different in controls and obese subjects (P ≥ 0.05). However, parameters like BMI, FPG, total cholesterol (TC), triglycerides (TG), low-density lipoproteins (LDL), and WHR were found significantly different from controls (P ≤ 0.001). Also significant difference was found in HbA1c% and random blood sugar in controls, persons with diabetes, and obese persons with diabetes (P ≤ 0.001). Two previously reported variations were found in leptin promoter i.e., C > T (rs72563764) and G>A (rs7799039). Both of these variations showed significant difference in allelic and genotypic frequencies between controls and persons with diabetes, controls and obese, and controls and obese persons with diabetes subjects (P ≤ 0.05) [Table 2]. However, frequency of TT genotype in C>A variation was not found different from that of controls and persons with diabetes subjects (P = 0.339). Also variation with rs7799039G>A did not show significant difference between controls and persons with diabetes (P = 0.29) and controls and obese (P = 0.16) with respect to AA genotype. The observed genotype frequencies of these variations were not in the Hardy–Weinberg equilibrium. We also analyzed the effect of single-nucleotide polymorphisms (SNPs) on several anthropometric and metabolic traits. 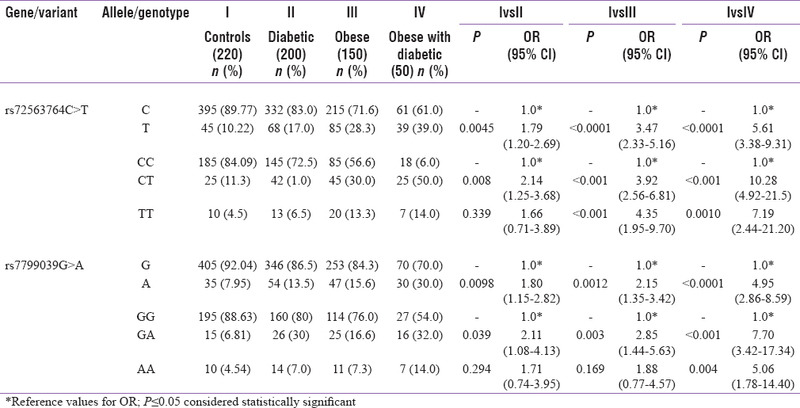 SNP rs72563764C>T showed [Table 3] significant association with TG (P = 0.021) in obese subjects. Additionally, this variant also showed association with FPG (P = 0.015) and RPG (P = 0.012) in obese persons with diabetes. However, this variation did not show any association with other parameters. Other SNP with rs7799039G>A showed [Table 4] significant association with postprandial plasma glucose (PPPG) (P < 0.0001) and RPG (P < 0.0001) in obese subjects and FPG (P = 0.05) and RPG (P = 0.003) in obese persons with diabetes subjects. This is the first systematic investigation of leptin promoter in persons with diabetes and obese Kashmiri subjects. A total of two known variations in leptin promoter i.e., −2549C>T (rs72563764) and − 2548G>A (rs7799039) upon sequencing were reported in current study. Variation with rs72563764C>T showed significant difference in allelic (P = 0.004) and genotypic (P = 0.008) frequencies between controls and persons with diabetes. Also allelic and genotypic frequencies were significant in controls and obese subjects (P ≤ 0.001) and controls and obese persons with diabetes (P ≤ 0.001) in this variation. Additionally, we sought the association of this variant with anthropometric and metabolic characteristics and it showed significant association with TG (P = 0.021) in obese and with FPG (P = 0.015) and RPG (P = 0.012) in obese persons with diabetes subjects. Another variation − 2548G>A with rs7799039G>A showed significant difference in allelic and genotypic frequencies between controls and persons with diabetes subjects, controls and obese subjects, and controls and obese persons with diabetes subjects (P ≤ 0.05). These variations indicated that they have possible bearing with obesity and diabetes. This variation was also analyzed for reporting the association with clinical parameters and it showed significant association with PPPG (P < 0.0001) and RPG (P < 0.0001) in obese and FPG (P = 0.05) and RPG (P = 0.003) in obese persons with diabetes subjects. Among the variants identified, −2548 G/A polymorphism, (rs7799039) is the most studied one in the 5′-untranslated region of the leptin gene. Substantial data indicated that the LEP −2548 polymorphism was associated with the variations in plasma leptin and BMI in both obese and non-obese individuals. The mechanism may be that the LEP −2548G >A polymorphism influences leptin expression, possibly at the transcriptional level, and therefore also adipose secretion levels of the hormone. However, the direct association between the –2548 G/A polymorphism and obesity remains vague. While most currently published studies have failed to identify a significant association between this genetic variant and obesity in various populations.,,,,, Three studies had found that the current variant was significantly associated with the risk of obesity in subjects of mixed race  and Caucasians., This is in accordance to our study as the SNP was found to be associated with obesity in our population also. Earlier studies had reported that −2548G/A variant are associated with weight gain although the allelic association was not clear. It should be further noted that some studies had found that allele A is associated with weight gain or increased glucose/lipid measures,,,, while others found significant results with the allele G. Li et al., reported that the G2548A variant is more common in Caucasians than African-Americans within the average weight groups. According to Jiang et al., the functional significance of the G2548A polymorphism is uncertain as the polymorphism is not at a conserved region among human, rat, and mouse species. On the other hand, G2548A polymorphism is located at the 5′ end of the promoter region of LEP. It has been postulated that this remote region might contain inhibitory elements for transcription in adipocytes. Although G2548A polymorphism lies in the vicinity to these elements and putative-binding sites, but its effect on leptin expression is still unknown. There is a high variability in the 5′-flanking region in the leptin gene and a large number of studies have been conducted on the association between leptin gene variants and the obesity risk. Our results are suggestive of the association of leptin promoter gene variations i.e., rs72563764C>T and rs7799039G>A with both diabetes and obesity. As per our understanding this is the first report demonstrating the association of the leptin promoter gene with obesity risk and diabetes in the Kashmiri patient population. Our results are interesting but should be replicated in the future in a larger cohort of the same ethnicity to validate the findings of the current analysis to confirm its biological relevance. This work was supported by the Department of Biotechnology, Ministry of Science and Technology, New Delhi and grants to Rubiya Darby the Department of Science and Technology, New Delhi, under the Young Women Scientist Scheme (Project No:– SR/WOS-A/LS-231/2007). Zhou Y, Rui L. Leptin signaling and leptin resistance. Front Med 2013;7:207-22. Mammes O, Betoulle D, Aubert R, Giraud V, Tuzet S, Petiet A, et al. Novel polymorphisms in the 5′ region of the LEP gene: Association with leptin levels and response to low-calorie diet in human obesity. Diabetes 1998;47:487-9. Mammes O, Betoulle D, Aubert R, Herbeth B, Siest G, Fumeron F. Association of the G-2548A polymorphism in the 5′ region of the LEP gene with overweight. Ann Hum Genet 2000;64:391-4. Hussain Z, Khan JA. Food intake regulation by leptin: Mechanisms mediating gluconeogenesis and energy expenditure. Asian Pac J Trop Med 2017;10:940-4. Yiannakouris N, Yannakoulia M, Melistas L, Chan JL, Klimis-Zacas D, Mantzoros CS. The Q223R polymorphism of the leptin receptor gene is significantly associated with obesity and predicts a small percentage of body weight and body composition variability. J Clin Endocrinol Metab 2001;86:4434-9. Chagnon YC, Wilmore JH, Borecki IB, Gagnon J, Perusse L, Chagnon M, et al. Associations between the leptin receptor gene and adiposity in middle-aged Caucasian males from the HERITAGE family study. J Clin Endocrinol Metab 2000;85:29-34. Lee GH, Proenca R, Montez JM, Carroll KM, Darvishzadeh JG, Lee JI, et al. Abnormal splicing of the leptin receptor in diabetic mice. Nature 1996;379:632-5. Clement K, Vaisse C, Lahlou N, Cabrol S, Pelloux V, Cassuto D, et al. A mutation in the human leptin receptor gene causes obesity and pituitary dysfunction. Nature 1998;392:398-401. Paracchini V, Pedotti P, Taioli E. Genetics of leptin and obesity: A HuGE review. Am J Epidemiol 2005;162:101-14. Yiannakouris N, Melistas L, Yannakoulia M, Mungal K, Mantzoros CS. The-2548G/A polymorphism in the human leptin gene promoter region is associated with plasma free leptin levels; interaction with adiposity and gender in healthy subjects. Hormones 2003;2:229-36. Hoffstedt J, Eriksson P, Mottagui-Tabar S, Arner P. A polymorphism in the leptin promoter region (-2548 G/A) influences gene expression and adipose tissue secretion of leptin. Horm Metab Res 2002;34:355-9. Portoles O, Sorli JV, Frances F, Coltell O, Gonzalez JI, Saiz C, et al. Effect of genetic variation in the leptin gene promoter and the leptin receptor gene on obesity risk in a population-based case-control study in Spain. Eur J Epidemiol 2006;21:605-12. Duarte SF, Francischetti EA, Genelhu VA, Cabello PH, Pimentel MM. LEPR p.Q223R, beta3-AR p.W64R and LEP c.-2548G>A gene variants in obese Brazilian subjects. Genet Mol Res 2007;6:1035-43. Ben Ali S, Kallel A, Ftouhi B, Sediri Y, Feki M, Slimane H, et al. The -2548G/A LEP polymorphism is associated with blood pressure in Tunisian obese patients. Blood Press 2008;17:278-83. Bienertova-Vasku J, Bienert P, Tomandl J, Forejt M, Vavrina M, Kudelkova J, et al. No association of defined variability in leptin, leptin receptor, adiponectin, proopiomelanocortin and ghrelin gene with food preferences in the Czech population. Nutr Neurosci 2008;11:2-8. Ben Ali S, Kallel A, Ftouhi B, Sediri Y, Feki M, Slimane H, et al. Association of G-2548A LEP polymorphism with plasma leptin levels in Tunisian obese patients. Clin Biochem 2009;42:584-8. Constantin A, Costache G, Sima AV, Glavce CS, Vladica M, Popov DL. Leptin G-2548A and leptin receptor Q223R gene polymorphisms are not associated with obesity in Romanian subjects. Biochem Biophys Res Commun 2010;391:282-6. Hinuy HM, Hirata MH, Sampaio MF, Armaganijan D, Arazi SS, Salazar LA, et al. Relationship between variants of the leptin gene and obesity and metabolic biomarkers in Brazilian individuals. Arq Bras Endocrinol Metabol 2010;54:282-8. Boumaiza I, Omezzine A, Rejeb J, Rebhi L, Ouedrani A, Ben Rejeb N, et al. Relationship between leptin G2548A and leptin receptor Q223R gene polymorphisms and obesity and metabolic syndrome risk in Tunisian volunteers. Genet Test Mol Biomarkers 2012;16:726-33. Sahin DS, Tumer C, Demir C, Celik MM, Celik M, Ucar E, et al. Association with leptin gene C.-2548 G>A polymorphism, serum leptin levels, and body mass index in Turkish obese patients. Cell Biochem Biophys 2013;65:243-7. Zhang ZJ, Yao ZJ, Mou XD, Chen JF, Zhu RX, Liu W, et al. Association of -2548G/A functional polymorphism in the promoter region of leptin gene with antipsychotic agent-induced weight gain. Zhonghua Yi Xue Za Zh 2003;83:2119-23. Mou XD ZZ, Zhang XR, Shi JB, Sun J. -2548G/A functional polymorphism in the promoter region of leptin gene and antipsychotic agent-induced weight gain in schizophrenic patients: A study of nuclear family-based association. Zhong Nan Da Xue Xue Bao Yi Xue Ban 2008;33:316-20. Calarge CA, Ellingrod VL, Zimmerman B, Acion L, Sivitz WI, Schlechte JA, Leptin gene -2548G/A variants predict risperidone-associated weight gain in children and adolescents. Psychiatr Genet 2009;19:320-7. Wu J, Yan WJ, Mo J, Yang HB, Wang ZZ, Lei MX, et al. Association of adiponectin gene polymorphism with obesity in children. Chin J Contemp Pediatr 2011;13:539-42. Gregoor JG, van der Weide J, Mulder H, Cohen D, van Megen HJ, Egberts AC, et al. Polymorphisms of the LEP- and LEPR gene and obesity in patients using antipsychotic medication. J Clin Psychopharmacol 2009;29:21-5. Li WD, Reed DR, Lee JH, Xu W, Kilker RL, Sodam BR, et al. Sequence variants in the 5′ flanking region of the leptin gene are associated with obesity in women. Ann Hum Genet 1999;63:227-34. Jiang Y, Wilk JB, Borecki I, Williamson S, DeStefano AL, Xu G, et al. Common variants in the 5′ region of the leptin gene are associated with body mass index in men from the National Heart, Lung, and Blood Institute Family Heart Study. Am J Hum Genet 2004;75:220-30. Gong DW, Bi S, Pratley RE, Weintraub BD. Genomic structure and promoter analysis of the human obese gene. J Biol Chem 1996;271:3971-4.